C.J. from ebookclassics was kind enough to pass along her copy of Miss Emily to me after she was done reading it (her review). She had a hunch it might be something I would like, and she was right. Thanks, C.J.! I read Miss Emily way back in July on one of our camping trips, and it was the perfect book to take with me. The chapters alternate between Emily Dickinson and her housemaid, Ada, making for a quick and engaging read. I got to learn more about Emily Dickinson’s life with her family, her ever-increasing resistance to leaving her house, her propensity to wear the colour white, her moods, and her obsession with words. At night, when I am not too bone weary, I dream. I would love to live in the softer planet of dreams. But if I cannot live in dreamworlds… then I am content to invent parallel worlds. Places of the imagination that I alone can inhabit. And these destinations are made of words. The rustling passions of life are contained more truly for me in words of poetry than in the everyday world. Life, as lived, is so desolate at times. Emily befriends her new housemaid, Ada, who has recently arrived from Ireland. Emily’s family, and her friend Susan, are not entirely comfortable with the friendship between them. Ada is both Irish and a servant; two good reasons to show superiority instead of friendship. But, after Ada finds herself in need of some help, Emily is determined to go against her family and stand up for her. It strikes me that perhaps it is not possible even to know another, no matter how much we long to. 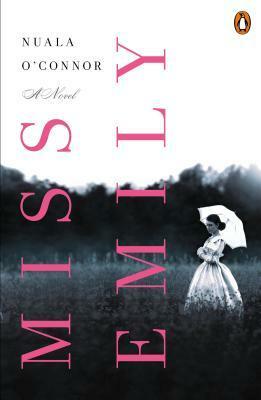 Miss Emily is short and sweet; I think if you are interested at all in Emily Dickinson, or reading about unlikely friendships and class divisions and the roles of women in the mid-1800s, you would enjoy this book. … I wondered if freedom is possible for anyone in this life or if we are all doomed to imprisonment one way or another. But no, I thought, there is always hope. It may be small and bald at first, but then it gathers feathers to itself and flies on robust wings. Bonus: This book describes the making of several kinds of yummy cake; it might be worth reading just for the baking that goes on. When they were making Emily’s birthday cake (a Black Cake), for the first time in my life, I was craving a fruitcake. 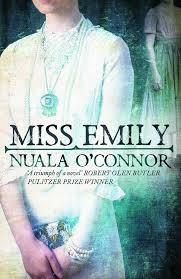 I’m looking forward to reading this, I really enjoyed reading her novel The Closet of Savage Mementos written as Nuala Ní Chonchúir, Miss Emily as an interesting follow on to the themes of that previous book has been written using her original birth name Nuala O’Connor. I will have to look into The Closet of Savage Mementos – thanks for mentioning it! Ah, Claire’s beaten me to it: I was going to suggest you hunt out her work under her Irish name. I’ve reviewed both The Closet of Savage Mementos and her debut novel You on my blog. I really liked how Emily and Ada bonded in the kitchen and I would always get hungry during those baking sessions! I thought it was so interesting how Emily didn’t care about class or where Ada was from at all. She really saw Ada as a whole person and someone she cared about and trusted. Emily seemed to me to be almost desperate for a friend, someone to hang out with in the kitchen (when she wasn’t in one of her funks). What did you think of her friendship with Susan? Was it just me, or did they seem *really* close? Yes, I agree there was something a little more to Emily’s relationship to Susan. Almost like she was in love with Susan …? I wondered about that… especially because it was clear she had no interest in marriage. Do you think the author was hinting at something that she didn’t really know was true, but could have been entirely possible? WordPress won’t let me continue our above conversation. I do think the author was hinting at something about Emily, but I’m not familiar with Emily’s history to know whether there was any evidence of this being a possibility or if it’s merely the author’s speculation/imagination. I’m not either, but I’m glad it wasn’t just me who thought so. Sounds like a good one. Added it to the TBR list. I think it’s one you would like, Lynn! When I was in college one of my dear friends gave me a collection of a Emily Dickenson’s poems, and so I eagerly accepted the ARC of Miss Emily as i wanted to know more about her life. I haven’t read it yet, (!) but I’m glad to know you liked it so much. I’m sure I will, too. If you already know a lot about her, then you might be disappointed. But, the story itself makes it a good book. Learning a bit about Emily D. makes it that much more interesting. I hope you like it! I am nearly finished this one and am loving it. I went to the Dublin launch of the book last week and Nuala O’Connor had baked loads of cakes to Emily’s recipes for us to eat. Yum! I’m finding the writing to be really beautiful and would recommend You if you are interested in her other work. Yes, I think I would love to check out a couple of her other books! And, yum, the cake! Did you try the Black Cake? I think I need to make it just to get it out of my system. I’ve been looking for this book. I would love to read it. What a coincidence! I just was given an ecopy through Netgalley! I read this a few months ago (but still haven’t reviewed it – bad blogger), and I had mixed reactions to it. I found it a little hard to get into at first, but then I was completed enthralled by Dickenson and it made me want to read a biography about her. However, the novel’s ending made me crave more – somehow it felt a little too rushed. Maybe that’s just a testament to how great the story was! I wanted more, too. But, I think that adding more would have made finding the right place to end the book more difficult. It also made me want to know more about Emily D. for sure. If you hear of any good biographies about her, let me know! It sounds charming. I have a weakness for novels about famous writers. I love Emily Dickinson and a book like this would send me back to the poems! I like to read about writers, too! Are there any books along those lines you would like to recommend? I think this is a good little story even without Emily Dickinson. But, making her one of the characters makes it just that much better! I’m always excited to read about authors and the setting you describe here sounds wonderful. I’ll have to check this one out!